Each member receives a full profile page on nhmade.com with a direct link to member’s own website and social media pages, photos and information. Member webpage includes interactive map to drive traffic to your location. 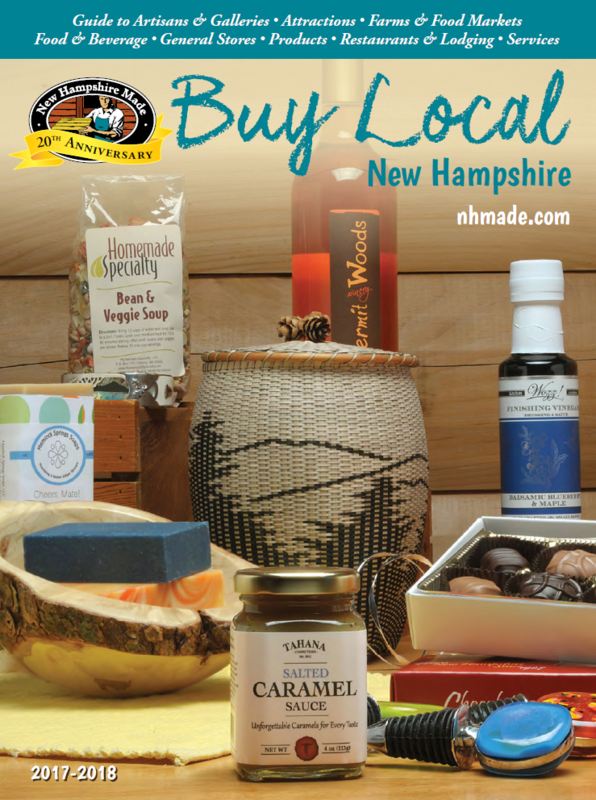 Member webpage can include direct link to your products sold on NH Made’s online store. Robust keyword search makes it easy for consumers to find your products and services. Consumers and businesses alike will find a complete list of member businesses who sell wholesale, have a retail location, offer fundraising programs and/or unique corporate gifts or wedding favors. Each member has a log-in allowing them to keep their page updated, ensuring a customizable web presence; training and assistance is always available. Any new member who doesn’t currently have a web presence immediately has one upon joining! Basic listing begins at $85; Marketplace feature with logo and photo & display ads also available. Receive regular email updates filled with upcoming events, promotional, media & vendor opportunities, workshops, seminars, NH Made news, member profiles and resources. Keep us posted on all your news so we can share it via social media, blogs and media relations. Similar to the New Hampshire Stores, these also serve as business development learning opportunities. “New Hampshire Made” (NH Made) is an active registered trade name with the State of New Hampshire. The NH Made logo is widely recognizable and signifies a quality, authentic, local product. 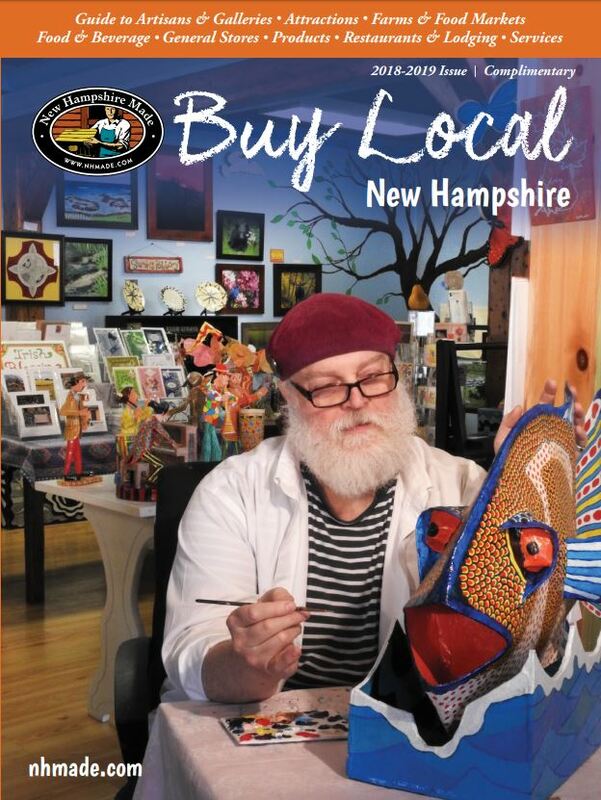 Members of NH Made are granted permission to use the logo on their own promotional materials including product packaging, business cards, websites, place mats in restaurants, retail store shelf talkers, trade show booths, sides of delivery trucks, etc. 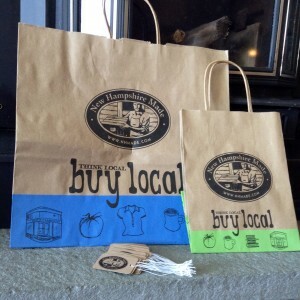 For Purchase Materials: Buy Local/logo paper handle bags in two sizes, logo hang tags, logo mini stickers and Buy Local decals. By purchasing these promotional items from NH Made service members in bulk, smaller quantity purchases & cost savings are passed along to our members. The matching funds program is designed to assist members with professional and business development opportunities which may not otherwise be possible. Relevant topics include social media, marketing & promotion website development, business planning, fiscal management, and the like. Cooperative relationships with like-minded organizations continue to expand – whether it’s other non-profit organizations such as Hannah Grimes Center, Women’s Rural Entrepreneurial Network, or business organizations such as the NH Small Business Development Center and SCORE, or agricultural groups such as the NH Farmers Market Association and NH Farm to Restaurant Connection. NH Made also works closely with state organizations such as the NH Division of Travel and Tourism Development, NH State Parks and Recreation, NH Division of Economic Development, NH Department of Cultural Resources, NH Department of Agriculture, Markets & Food and other business support groups such as Chamber of Commerces and the NH Travel Council. By partnering with these organizations our members are often notified of a variety of business seminars, trainings and classes offered by our partners. A multitude of other tie-in opportunities occur throughout the year including the NH Farm & Forest Expo, The Made in NH Expo, NHPTV Spring TV Auction, The Stratham Fair, The Deerfield Fair, Eastern States Exposition, Farmers’ Markets and Winter Markets statewide. NH Made members can also access a discounted shipping program through UPS. NH Made and its members are promoted via statewide events, presentations, and public service announcements in traditional and digital media. We’re constantly pitching stories about our members! NH Made members often collaborate with one another, offer member-to-member discounts and camaraderie. NH Made celebrates its member successes and offers members a chance to network with one another at several regional membership mixers each year. In addition, NH Made offers 1-2 educational seminars each year, utilizing the expertise of our service members. NH Made also offers its members an opportunity to participate in our Facebook community forum. The forum is open to members only, and serves as a platform to share ideas, ask questions, look for opportunities and explore best practices.